Review: Jealousness Waterproof Liquid Eyeliner | Memorable Days : Beauty Blog - Korean Beauty, European, American Product Reviews. I recently reviewed the flawless foundation of the brand Jealousness USA and i am currently using that every day since it creates a flawless and smooth look, go to the blogpost if you've missed it. When i posted my "haul" blogpost, a lot of you were curious about the eyeliner of this brand since the packaging looked super cute. So here is the review of the Jealousness Waterproof Liquid Eyeliner which I received from Eyecandys.com. 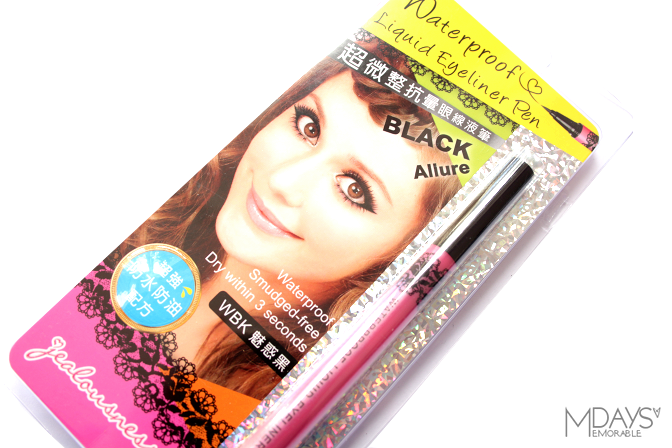 Taiwanese beauty bloggers are all raving about the new Jealousness Waterproof Eyeliner Pen. With its soft, flexible brush, this eyeliner makes drawing precise, clean lines a breeze! Deep, rich pigment dries in only seconds and lasts all day without smudging thanks to the water-resistant polymer coat formula. WHERE TO BUY JEALOUSNESS USA PRODUCTS? You can purchase this eyeliner at the online beauty shop: www.eyecandys.com (link to the product). It's sold for $15,90 there. There aren't many shops where you can purchase Jealousness USA products, it's even hard to find it on Ebay so you can't really compare the price with other shops. A good thing about it is that Eyecandys.com provides FREE WORLDWIDE SHIPPING, so that's a plus! Make sure to use my code: MEMORABLEDAYS to get a free gift at checkout. It has a pink packaging with lace printed details with English as well as Chinese descriptions. It's definitely a good thing that its written in English as well, by this everybody is able to read how to use it and also the ingredients. This felt tip makes me think of the felt tip of the Dolly Wink eyeliner and from the K-palette tattoo eyeliner. It's very thin and very flexible. This would probably be hard to manage for people who just started to use an eyeliner, but it is perfect for people who are more advanced. I think it's very easy to use and you are able to create precise lines with it. As you can see it is very easy to create extremely thin lines with it, which means that you are able to create precise lines. It's ideal for drawing cat eyes or a winged eyeliner. The color isn't that intense, it's a bit dark grey-ish as you can see in the pictures below but you can go over the same line if you want it to appear darker. I don't really mind that it's grey-ish since it will create a more natural look on me. IS IT WATER-, SWEAT-, AND OIL-PROOF? 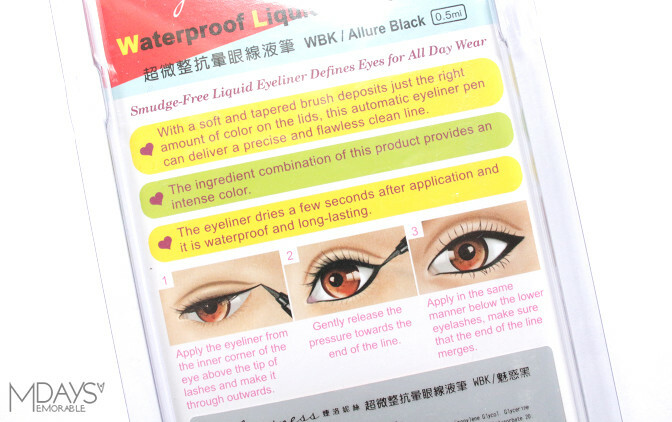 The name of the product is called a waterproof liquid eyeliner so I expect that it would be very water resistant. Yes it's true, it won't smear, smudge nor flake when it reaches water, so you can say it's waterproof. However, once you rub it while its wet, it will come off easily so its not rub-proof. On the other hand when it doesn't reach water, it is quite rub-proof, it will stay on the eyelids for a long time. Therefore, make sure that you don't rub it when it reaches water. Is it sweat and oil proof? My eyelids are very oily so I directly noticed that the eyeliner was getting into my crease after blinking for a few times after application. I also have monolids so i get this problem quite often. It will smudge a bit when your eyelids are oily. I would say that this eyeliner is more suitable for people without oily eyelids. I think this eyeliner would be very suitable for people without an oily eyelid. The felt tip is extremely easy to manage and you are able to create very thin lines with it. The ink dries immediately (within 2 seconds). It's ideal for cat eyes and a winged eyeliner look.